Why work when we can get Robots? I was just reading article in the AgWeek yesterday about robots being developed that will pick citrus crops. The article framed the need for robots in terms of the immigration debate; since California has such a great need for immigrant labor, robots may be their saving grace. Immigration besides, my main reaction was “Huh, what are WE here for anyway?” Maybe I’m just a romantic, but we’ll lose more than employment when robots can do all the labor on farm. There’s something really beautiful and refreshing about caring for the ground and creation with your own two hands. Sure, it’s tiring work some days, but a person sleeps really well and the work gives me, at least, a deep sense of satisfaction. I’m game for appropriate technology (I use technology all the time – this blog a case in point), but we must also consider what’s lost as well. I think our culture will be poorer with fewer people working in agriculture with their hands. One point to consider…if such huge fruit and vegetable operations can’t make it in California without so much imported labor, maybe multiple families with less reliance on outside labor should replace them. I’m guessing we’d all spend a bit more for summer stone fruit and winter citrus in this scenario, but having more families on the ground building businesses is a much better outcome than a single mega-farm with an army of robots. A quart of tomatoes: Green Zebras (yes, they are ripe when green) and standard Celebrity toms. Spaghetti Squash: It’s best to store all winter squash in warm, dry locations. A Buttercup Squash: Boy, this variety did not pull through well this year – terrible, since this is the top choice for many. Leave a comment Why work when we can get Robots? I should say that things always happen when I’m out of town. So it shouldn’t have come as a surprise when Maree called me when I was boarding a plane in Pittsburgh yesterday. Sitting in the kitchen getting some stuff ready for Satuday’s harvest party, Maree and my mom heard an outburst of yips from our neighborhood coyotes, seemingly just outside the patio window. Knowing something was up, my parents and Maree quickly jumped into action, tramping all around a sheep pasture in the middle of the night without a flashlight to ward off the predators. They were a bit confused that they couldn’t find the whole flock, but what was one to do at midnight, especially when Mar had to drive into the train station at 2 am to pick me up after a botched MSP connection? They figured they had scared the pack away with all their commotion and went off to bed. Coyotes, after finding a good source of protein, are pretty persistent I guess as my survey of the pasture this morning uncovered 7 sheep (mainly lambs slated for sale this winter) strewn from the trees down to the pond. With one unaccounted for, losing 8 sheep when you only start with 20 is pretty major. Damn. It always seems that when we feel like all of the balls we’re juggling are doing fine, one has to drop. I think this is why country songs are so tragic and sad. Edamame: Edible soybeans – the big messy bunch stuffed into the box. Your job is to take all the pods of the stem and boil them in salted water for a few minutes. All the other stem and leaves can be composted. Turnips: There are two kinds of turnips in the box, the traditional white and purple ones and these all red ones you may mistake for beets. Rutabaga: These roots should bigger than the turnips with yellow flesh, although it would be east to confuse the two. Typically turnips are rounder and rutabagas are elongated with a bigger top. Fresh Rosemary: With all these roots in the box, this would go great with these roasted in the oven. Sunshine Kabooca Squash: These orange/red winter squash are a lot like everybody’s favorite, buttercup, but better. Little Cars of the World Unite! Considering we cart large amount of produce around the countryside, you’d think we drove a diesel pickup or some other powerful machine. But, instead, we like to drive little cars to get produce from point A to point B. 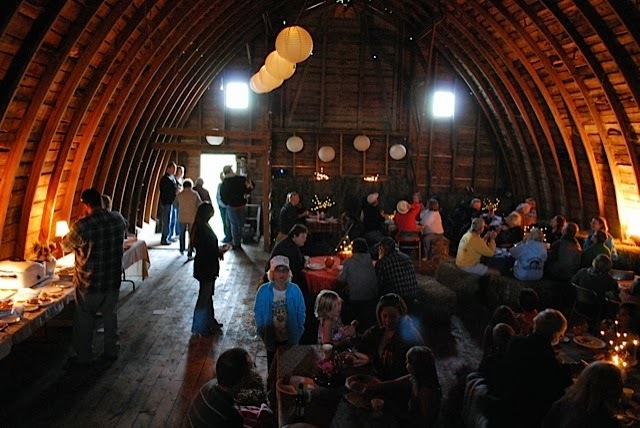 To get the CSA boxes delivered on Fridays, Maree drives towards Detroit Lakes and I drive towards Pelican Rapids. All told, it is an investment of 2.5 hours for each of us and a round trip of 80-90 miles. Since we do this trip every Friday for four months of the year, we really want to get the best fuel economy possible. surprised when our mechanic informed us of the transmission going out. Our other vehicle is the farm workhorse, an old GMC Safari van, but, with about 15 miles/gallon fuel economy, we knew we really had to make the switch to something else. 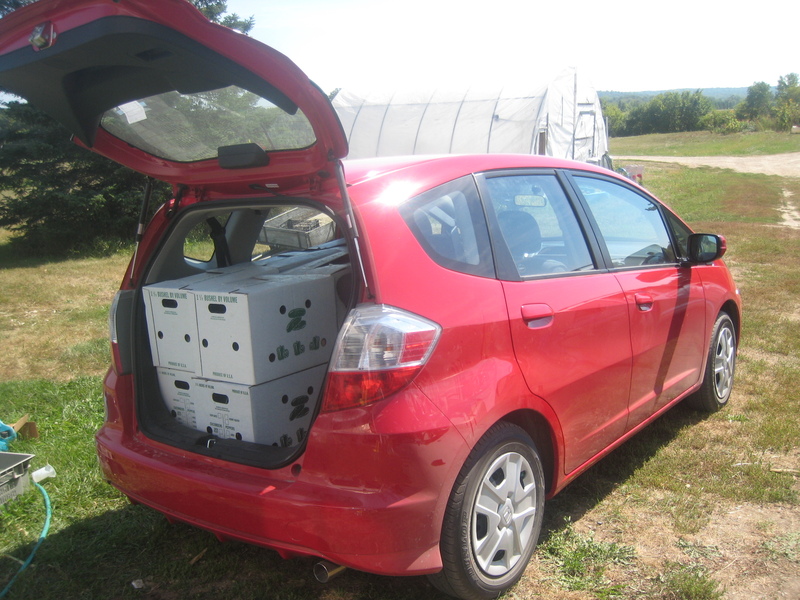 So just last week we purchased a new Honda Fit, which fits our bill of having good fuel economy (about 35 on the highway) and being able to transport a fair amount of cargo. Today was it’s first trip on the CSA delivery route and I was almost giddy that this little car can fit 14 CSA boxes in the back plus one kid. After droning on about your car situation, Ryan, what’s the significance? Well, we are like all other businesses and households working to find whatever ways possible to save energy and money in this age of $3.50 gasoline. Doubling our fuel economy on one delivery vehicle definitely does this. The added benefit to you, our members, is that it also cuts carbon footprint for the food you eat each week. The greater significance, however is that I don’t think we’re alone in this trend. I would expect the commercial fleet (delivery trucks, couriers, etc) of this country to get smaller and smaller in size as I imagine many businesses small and large will be making this switch towards fuel efficiency. A Melon: I tried getting everybody a melon other than a cantaloupe, but I just didn’t have that many. Some received a white-flesh Ananas melon called ‘San Juan’ and others received a crisp and white fleshed-Korean melon called ‘Sun Jewel’ (it’s the one which is oblong and yellow with white stripes). A Half-dozen Sweet Corn: I suspect the last of the season. Beets: All are a mix of traditional red beets and a gold beet variety. Leave a comment Little Cars of the World Unite!